Iced tea is a delicious and refreshing drink, but did you know that many store-bought brands contain more sugar than a soft drink? When you make your own at home, you’re in control of the ingredients and the sugar content which means you’ll get a healthier product. In this blog post, you’ll find a delicious and healthy iced tea recipe that’s easy to make too. The star ingredient is matcha powder which gives the tea a light and refreshing flavour without the calories. Matcha is an antioxidant-packed superfood that more people are making a staple in their daily diet for the health benefits. Matcha powder is created by turning the whole tea leaf into a vibrant powder. 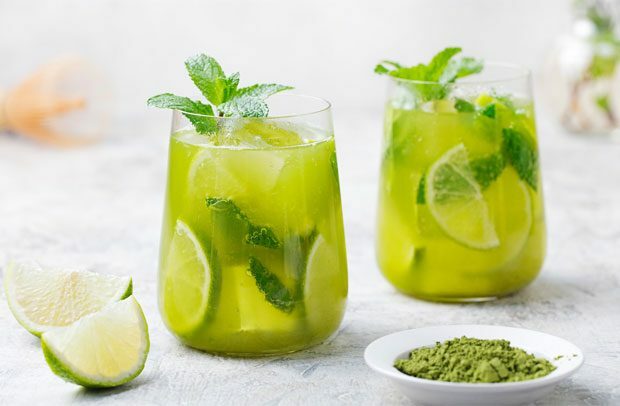 The process used to create matcha preserves all the health benefits in the leaves — read more about the matcha health benefits here. 1. Mix the matcha into half a cup of hot water. Stir thoroughly to remove any clumps. 2. Stir your teaspoon/s of pure maple syrup into your cup. 3. Pour the tea into a jug half full of water. Stir to mix, and add ice. 4. Add the apple, lemon and mint leaves. Stir and enjoy! Note: Ensure you buy matcha that is high quality so you receive the full health benefits. High quality matcha is from Japan, premium grade or higher, and should be a vibrant green colour. Erin Young is a health writer and a tea expert. She owns two tea brands; Evergreen Matcha in the USA and Zen Green Tea in Australia. She partners with sustainable tea farms in Kyoto, Japan to source her premium matcha powder. What’s Lambrini Like? Trying Lambrini For the First Time!